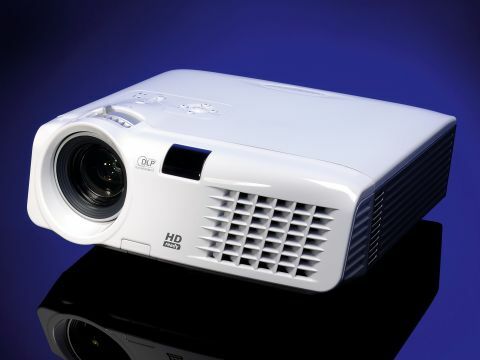 The Optoma HD70 represents a breakthrough in the pricing of home projectors; it's an HD-ready, 720p (pixel) DPL projector for under £700. If you were thinking of getting a home theatre set-up, and thought 480p was all your budget could afford, think again. To achieve this price point, Optoma has made some small compromises. Compared to the HD72 or HD73, the image is slightly lower in quality. You get an 8-bit image processor in the HD70, as opposed to 10- or 12- bit at the top end of the market and, correspondingly, if you did a side-by-side comparison, the image would appear less refined - but only if you were squinting! The resolution is a native 1280 x 720, so if you use your Mac as the signal source, some minor scaling of the Desktop will be necessary. There's no DVI port here, but that's something you could get around if you bought a cheap DVI/VGA adapter. Considering the price, none of these points are worth holding against the HD70. We watched parts of Schlinder's List and Jumanji using a Mac to display the dark film and a bright, colourful one respectively. Both displayed wonderfully in medium light. The HD70 gives a colourful, crisp image with enough contrast to pick out the shades of grey. The projector comes with a remote for fine-tuning from your armchair, or jumping to the five picture modes: Cinema, Bright, TV, Photo and User. You can flick between different display ratios, too, which are 4:3, 16:9, LBX and Native. We stayed in these default settings, although there are finer controls with sliding bars if you want to set up your own custom picture. The software interface is easy to control, either with the remote or the onboard buttons. At the front of the projector are zoom and focus wheels that need manual setting, which can both be tuned using the remote. The throw angle is very user-friendly, too. The HD70 pitches up the image, so from roughly 1m from the wall the image appears around 30cm above the lens level. There's also a quick release button that drops a stand down under the front of the projector to increase the angle. This angle is useful if you mount the projector to a ceiling, although you'll need to buy the brackets separately and put some time into installing it. Fan noise is clearly audible but not a big issue. There are vents all around the shell to keep the temperature under control and avoid overheating. The HD70 is a joy to use; it's well-built and a good performer. For £685, the image quality and friendly features are hard to knock.